Taylor...Imma let you finish, but Camila Cabello is hands-down the newest dancing queen of awards shows. The "Havana" singer got up out of her seat during Maluma's performance at the MTV Video Music Awards and showed off her dance skills. After just a moment of coaxing, Cabello's mom Sinuhe Cabello joined her daughter for a brief waltz. The Artist of the Year and her mom looked like they were having the absolute time of their lives in the front row. This year was Cabello's time to shine, officially dethroning Taylor Swift as Master of the Front Row Dance. Swift has been known to show off her moves at various shows, including the 2013 VMAs and 2018 Billboard Music Awards. Lest we forget the 2014 Grammys when the "Delicate" singer shimmied to Beyoncé's performance of "Drunk in Love"? Most of the time, she's sitting next to and rocking out with bestie Selena Gomez. Back in 2014, Swift explained her penchant for busting a move at award shows. "I used to get really nervous at awards shows because, seemingly, they're a huge pressure cooker," she told NBC's Late Night at the time. "So you're in the front row and you're sitting there like, 'Maybe I should sit here like this.' A couple years ago I just decided, 'No. This is the coolest concert you could ever go to. This is like all these incredible acts playing their biggest songs and I get to be front row and I'm going to dance during this because I feel like it—and not because it looks cool, because it doesn't.'" At the very least, the "Shake It Off" singer can make fun of her awkward dancing and accept the fact that she has become a meme queen. She even named one of her most famous moves the "Mom-Croon." She described it on Tumblr at the time in vivid detail: "The way your mom gets taken away by a tune from her high school days, glass of red wine in hand, shuffling around the room as her teenage kids roll their eyes in disdain." In fact, the "Mom-Croon" means the dancer has reached a "level of musical transcendence." Allow Swift to explain: "Those who know how to Mom Croon cannot see the eye rolls of haters...Once you perfect the mom croon, you are truly free." Although Cabello is the newest dancing queen in town, she still has a soft spot for Swift in her heart. After all, Cabello is tagging along with Swift on her tour. The VMA Video of the Year winner told E! News' Zuri Hall about her relationship with the Reputation artist. 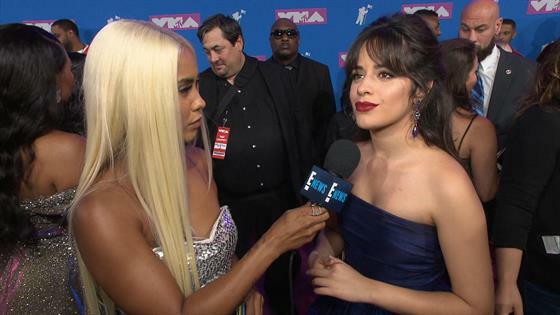 "I think we definitely have the same personality in a lot of ways, especially talking about love and relationships, boys, music," Cabello said. "I was a really huge Taylor Swift fan before I even met her, and I think it's because we both have the hopeless romantic thing."